Clean and cut the broccoli, keeping some tops to garnish the dish. Chop the onion into thin slices. Heat the extra virgin olive oil in a large skillet over medium-high heat. Add the onion, sautè for 3 minutes. Add the broccoli and then the vegetable broth. Cook for 10 minutes. Once is cooked blend it to obtain a thick cream, seasoning, if necessary, with salt. 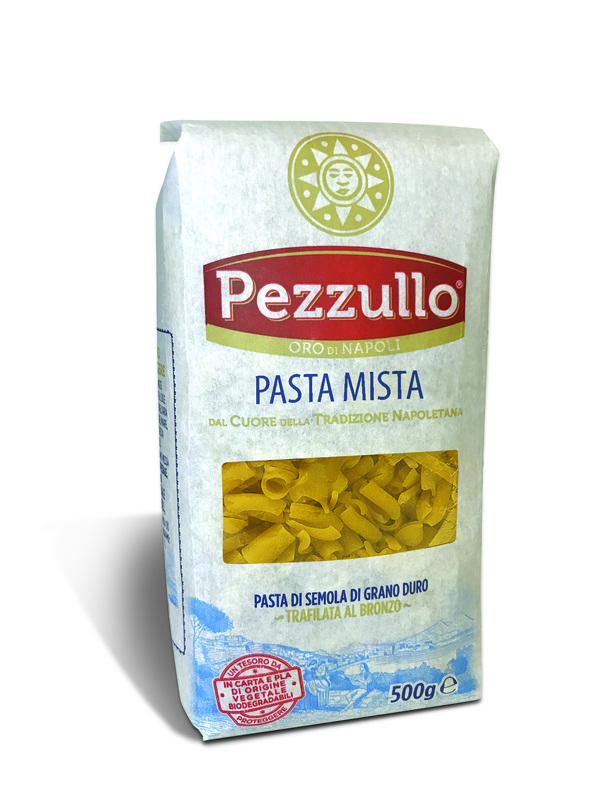 Cook Pezzullo Fusilli according to package directions until tender yet al dente, reserving 1 cup of the cooking liquid. Meanwhile heat the extra virgin olive oil in a skillet with the garlic cloves, the anchovy fillets and the parsley. Sautè for 3 minutes, remove the garlic cloves and add the cooking liquid. Add the pasta to the sauce and toss it. To serve: put in a dinner plate first the broccoli cream, then the fusilli and finally garnish with slices of tuna bottarga and some broccoli (just the top part, previuosly fried). Serve. Clean and peel the prawns, cut them in such a way as to get a tartare and season it with extra virgin olive oil, salt and pepper. Cut the green part of the zucchini into thin slices. Heat the extra virgin olive oil in a large skillet over medium-high heat. Add a clove of garlic and zucchini. Season with salt. Cook Pezzullo Linguine according to package directions until tender yet al dente. Add the pasta to the pan with zucchini and toss over high heat for 1 minute. Put in a dinner plate Pezzullo Linguine, forming a sort of nest. On the top put the prawns tartare; garnish with tomato flakes and parsley leaves. Serve. Clean well the scorpionfish in order to get 15 small cubes for each portion. Use the fishbones to make a broth. In a pot make a mirepoix with extra virgin olive oil, celery, carrot and onion. Sauté for 3 minute; add the white wine. Let it evaporate and cover with ice and some tomatoes. Cook until the sauce has reduced by half. Mix everything in the food mill, then filter it. Let reduce slightly the sauce until the desired density. Cook Pezzullo Vesuviotti according to package directions until tender yet al dente. Add the pasta to the scorpionfish sauce adding slowly the broth. 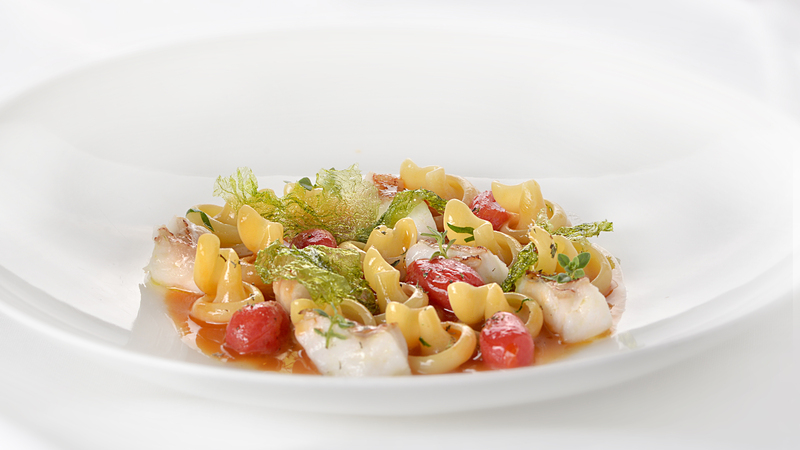 Garnish with fried algae, cherry tomatoes and buds. Serve. Heat the extra virgin olive oil in a large skillet over medium-high heat, add garlic cloves, anchovies and chili pepper from Senise. Cook for 2 minutes. Add the codfish chopped into little pieces. Cook for 5-6 minutes and then add the fresh cream. Cook, stirring occasionaly, for 10 minutes. Put the cooked sauce in the blast chiller and keep it for 24 hours. Using the stainer, fill up the siphon by loading it with two vials. Let open the clams frying oil, garlic and parsley. (Get rid of any clams that haven’t opened.) Once opened shuck the clams. Cook the Spaghettoni according to package directions until tender yet al dente. Add the Spaghettoni to the pam with the sauce of the clams. If necessary season with extra virgin olive oil and salt. To serve make a splash with the parsley sauce in a dinner plate. 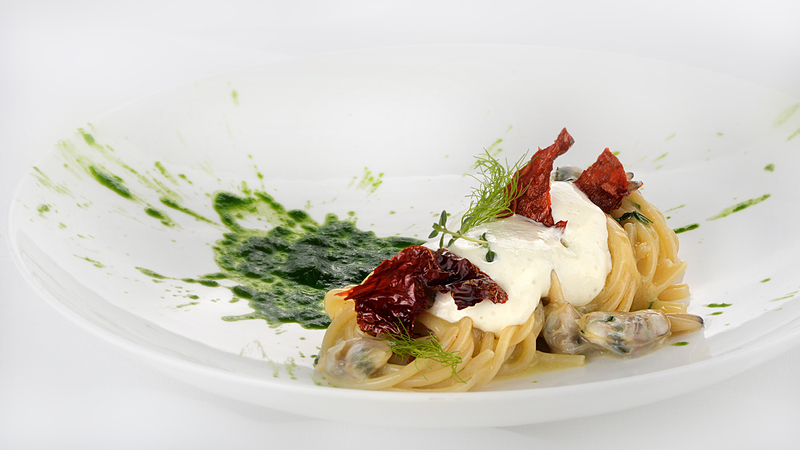 Put Spaghettoni trying to make a nest, add Baccalà foam and garnish with fried Chili pepper from Senise. Heat the extra virgin olive oil in a large skillet over medium-high heat until very hot and almost smoking. Add the minced onion and then the tomatoes. Reduce the heat and cook for about 5 minutes. Add the basil and then blend it. Bake the aubergines in the oven at 300° for 12/15 minutes; peel them. Season with salt and pepper. Blend them in order to obtain a creamy foam. Cook Pezzullo Penne rigate according to packaging instructions reserving 1 cup of the pasta cooking water. Sautè the cooked pasta with butter, grated cheese and the reserved pasta cooking liquid. Toss over high heat for 1 minute. 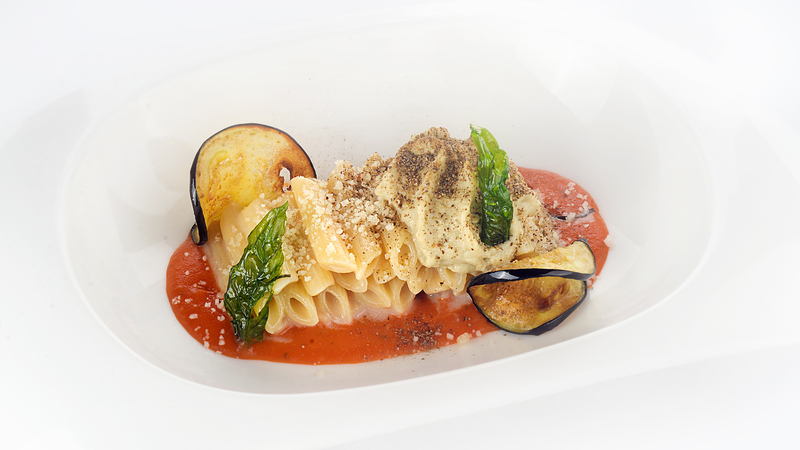 In a dinner plate put first the tomatoes, then the pasta and finally the aubergine foam at a temperature of 60°. Garnish with basil and thin slices of aubergine, previously fried. Sprinkle aubergine powder onto the pasta. 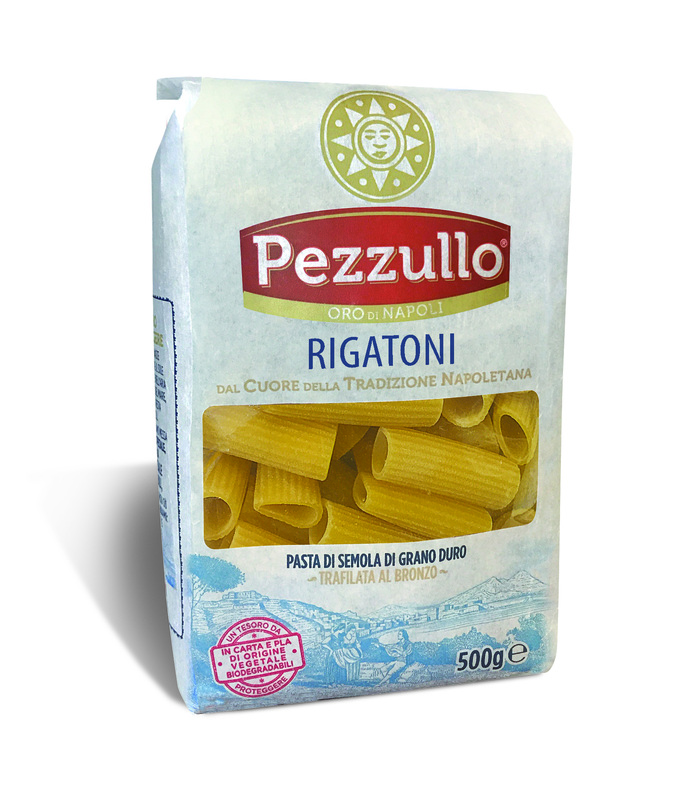 Cook Pezzullo Rigatoni according to package directions until tender yet al dente. Reserve 1 cup of the pasta cooking water. Sauté Pezzullo Rigatoni with butter and the pasta cooking water. Serve with grated pecorino cheese and season with salt and pepper. Sprinkle with black truffle, pecorino and pepper. Garnish with buds. Clean and wash the squids. Cut them into thin stripes. Heat the extra virgin olive oil in a large skillet, add the onion. Cook for 3-4 minutes or until softened and slightly browned. Add the green part of zucchini, chopped into thin stripes. Cover all with vegetable broth. Cook it for 7/8 minutes, blend everything to make a smooth and dense cream. If necessary season with salt. In a frying pan fry the garlic cloves with the extra virgin olive oil. Sprinkle the squids and season with salt, pepper and herbs. Cook the Farfalle according to package directions until tender yet al dente. Add the pasta to the frying pan with extra virgin olive oil, garlic and parsley previously prepared. Put in a pasta bowl zucchini’s cream, pasta and on the top the squids. Decorate with buds, fried zucchini’s slices and tomato powder. Serve. Peel and cut the potatoes into little cubes. Chop celery and onion in thin slices. Heat the extra virgin olive oil in a sauté pot over medium-high heat until almost smoking. Add the onion and the celery. Sauté for 2 minutes. Reduce the heat to medium and add the potatoes. Cover with the vegetable broth. In a skillet sauté the squids with extra virgin olive oil, salt and pepper. Cook Pezzullo mixed pasta in the vegetable broth together with the potatoes. Cook, stirring occasionaly until the pasta becomes al dente and the broth is a cream. When it’s ready season with extra virgin olive oil. To serve put the pasta in a cookie cutter. Place on the top the squids, sprinkle the basil powder around the circumference. Garnish with celery and thyme sprouts. Wash and cut some cherry tomatoes in thin slices, season with salt, oregano and extra virgin olive oil. Chop the remaining cherry tomatoes into small cubes. Meanwhile drain the mozzarella from its water and chop it into small cubes seasoning with a pinch of salt and oregano. Heat the extra virgin olive oil in a large skillet over medium-high heat until very hot and smoking. Add the garlic cloves. Sautè for 2 minutes. Reduce the heat to medium and add the chopped tomatoes. Remove the garlic cloves and add the basil. Cook Pezzullo Spaghetti according to package directions until tender yet al dente. Add the spaghetti to the pan with tomatoes, season with extra virgin olive oil and salt. Toss over high heat for 1 minute. 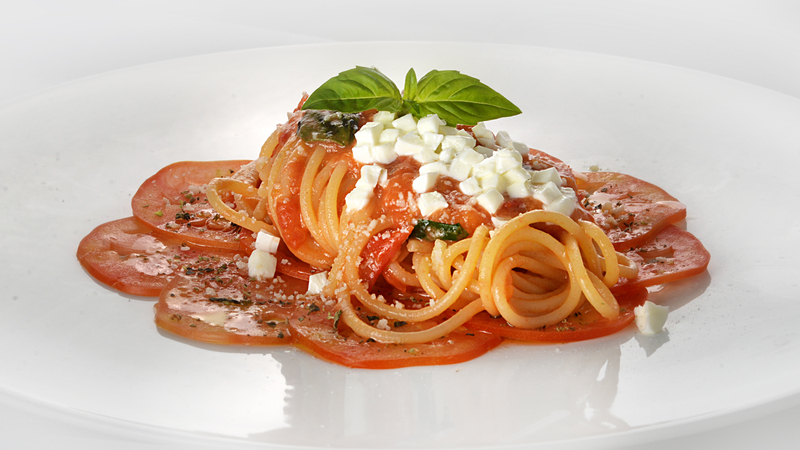 Put the thin slices of tomato in a dinner plate trying to form a circle, put on the spaghetti and add the shredded mozzarella. Garnish with basil. Serve. Clean the cuttlefish well and retrieve the ink. Chop the onion into thin slices. Heat the extra virgin olive oil in a large skillet over medium-high heat until very hot. Add the chopped onion and then the peas. Cover with the vegetable broth and cook for 7/8 minutes. Once cooked blend all seasoning with salt and pepper, in order to obtain a pureed soup but not very dense. Cut the cuttlefish into the shape of thin noodles, season with salt, pepper and some chopped herbs. 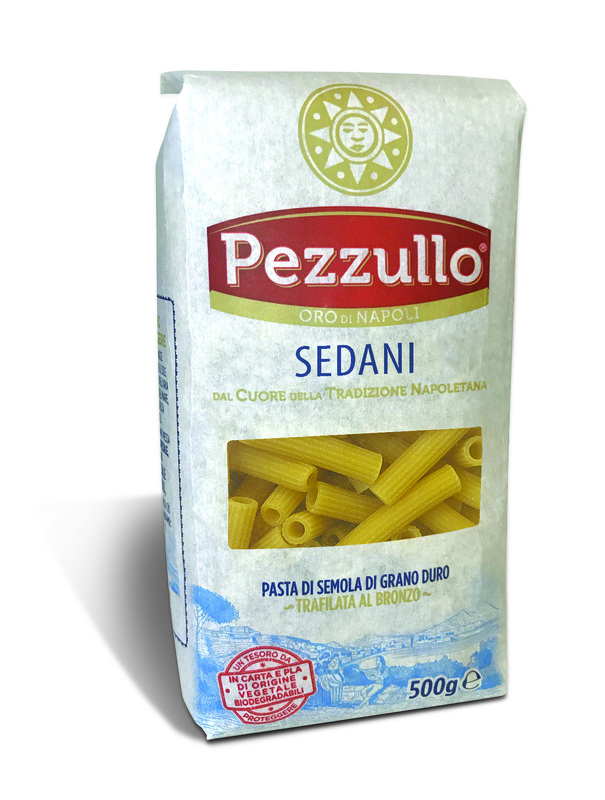 Cook Pezzullo Sedani according to package directions until tender yet al dente. Meanwhile heat the oil in a skillet over medium-high heat with the garlic clove and the parsley, adding slowly the cuttlefish ink. Once the black sauce has reduced slightly, add the pasta to get the black colour. Put in a dinner plate the pea cream, the coloured pasta and on the top the cuttlefish noodles. Garnish with boiled peas and thyme sprouts. 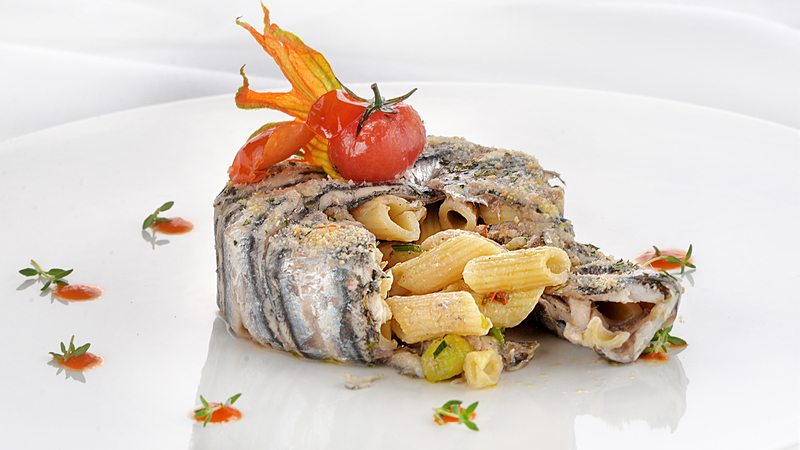 Clean the anchovies, debone them and wash them with running water for 15 minutes. Put the cleaned anchovies in a cookie cutter with a diameter of at least 8 cm. Season them with salt and pepper. Cook Pezzullo Mezze Penne rigate according to the package instructions until tender yet al dente. Meanwhile heat the extra virgin olive oil, add the garlic clove and the chili pepper. Sauté for 1 minute. Add the anchovies in little pieces and then the cooked pasta. Add the pumpkin flowers, chopped into thin slices. Add extra virgin olive oil and chopped parsley. Put the cooked pasta in the cookie cutter closing it with the anchovies. Bake in the oven at 140° for 10/15 minutes. Garnish with fried cherry tomatoes, dried pumpkin flowers and some drops of tomato sauce. Serve. Chop the pumpkin into small cubes, sprinkle it with a bit of butter, minced onion and the herbs you prefer. Crumble the sausage and season lightly with extra virgin olive oil, onion and a few herbs. Let rest it for a couple of hours; meanwhile fry the provola. Cook Pezzullo Mezze maniche, sprinkle them in the sausage sauce, cooked with butter, minced onion and meat broth. Transfer to a dinner plate. Put the pasta, sausage’s pieces and pumpkin assembling a sort of chessboard. Sprinkle with the smoked provola cheese and decorate with the buds. Serve. Clean and cut three artichokes into two parts, the other three should be cutted in thin slices. Put all the artichokes in water and lemon for 30 minutes. In a large skillet heat the extra virgin olive oil until very hot and almost smoking. Add the minced onion, the celery and the carrot. Cook for 3 minutes or until softened and slightly browned. Add the artichokes divided into two parts and cover with vegetable broth. Once the artichokes are cooked, blend them in order to obtain a semi-dense cream. Drain the other three artischokes, cover with flour and fry them at 160°. Cook Pezzullo Penne Candela according to package instructions. Sautè them with butter and the grated ricotta cheese. 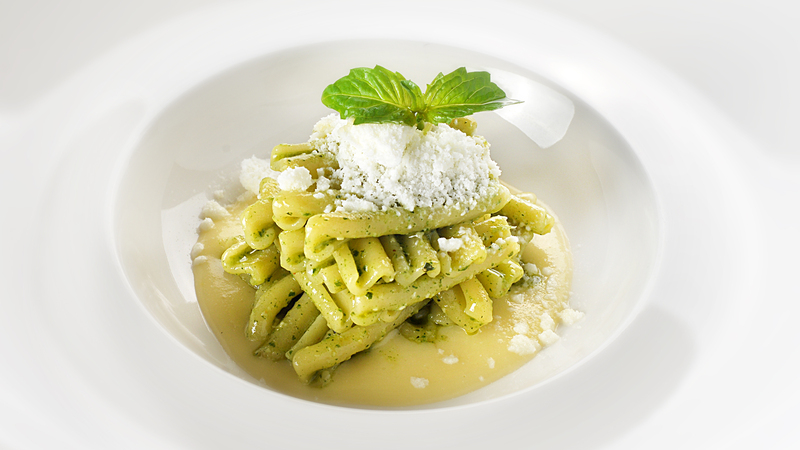 Put the pasta in a dinner plate, garnish with the fried artischokes and the fried parsley leaves. Serve. Take the basil, peel it, wash it and blend it with extra virgin olive oil, pinoli and the garlic clove. Finally add the cheeses (Parmigiano Reggiano and Pecorino Romano) and continue blending. To make the potato cream: chop into little pieces the potatoes and the onions. Heat the extra virgin olive oil in a pot and put the chopped potatoes and onions. Cook for 3-4 minutes and then cover with broth. Once the potatoes are cooked, blend them to get a cream. To make the mozzarella’s snow: cut the mozzarella, freeze and blent it using Bimby. Cook the Pezzullo Caserecce according to packaging directions until tender yet al dente. Once the pasta is ready blend it with the basil pesto. Spread the potato cream in a bowl. Place over Pezzullo Caserecce in order to get a sort of cube. Complete the dish by adding mozzarella snow decorated with a basil leaf.